Saturday April 23 1910 The wind blew so hard last night we could not sleep. It was not so bad today. I did cake baking and other cooking. Will went to town at 12.12 with the butter for the folks. It began to snow and I took my little chickens down in the furnace room It was a frightful day freezing ice in the shed kitchen. I took care of my chickens and read some. 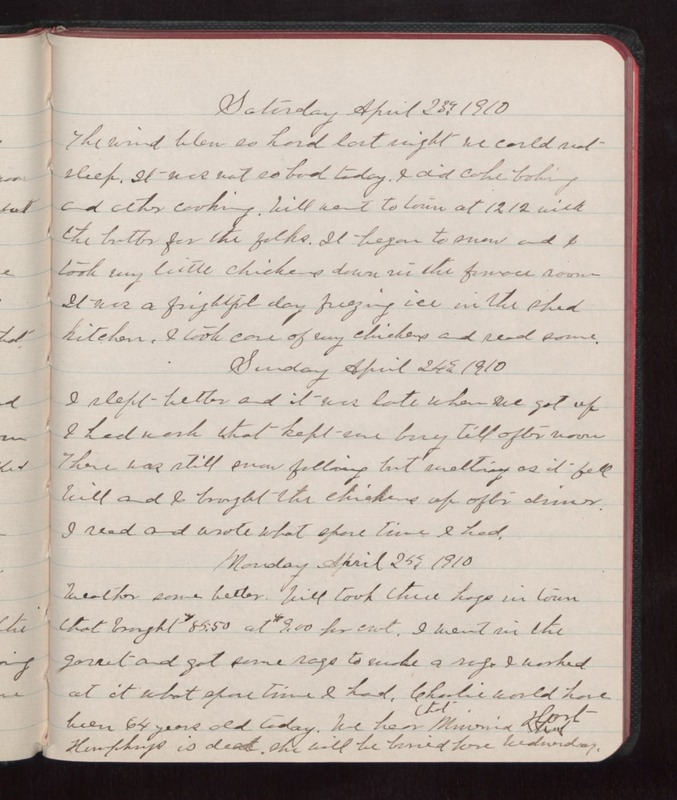 Sunday April 24 1910 I slept better and it was late when we got up I had work that kept me busy till afternoon There was still snow falling but melting as it fell Will and I brought the chickens up after dinner. I read and wrote what spare time I had. Monday April 25 1910 Weather some better. Will took three hogs in town that brought $85.50 at $9.00 for [cwt?]. I went in the garret and got some rags to make a rug. I worked at it what spare time I had. Charlie would have been 64 years old today. We hear that [Minonia?] Hart Humphreys is dead. She will be buried here Wednesday.